Located right on the beautiful Lower Carlton Beach on Reeds Bay, sheltered by lush greenery and bright florals. Located right on the beautiful Lower Carlton Beach on Reeds Bay, sheltered by lush greenery and bright florals, Carlon Beach Villa sits overlooking the stunning ocean that goes on as far as the eye can see. 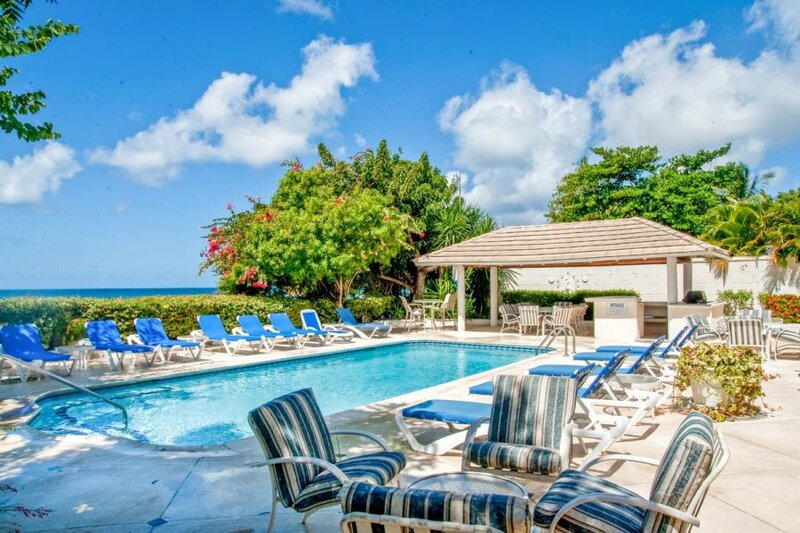 This four bedroom villa is the perfect place to stay during a getaway in Barbados, and not only because of its sensational location. The villa is private and fully enclosed, but still offers extensive beach views and the beach is quite literally at your doorstep. Begin your days in the open plan living space, sipping on a tea or coffee as you look out onto the ocean, deciding what the day will hold - lounging by the pool? Exploring Barbados? Or the beach bar? This home is well-equipped for everything you might need, including air-conditioning in the bedrooms and en-suites so you can get a restful slumber. The bedrooms are spread between the first and ground floor, three are upstairs with a sitting room complete with cable television. Two of the bedrooms and the living room all have stunning sea views. Then downstairs is the fourth bedroom and en-suite, as well as the open plan living room which boasts a built in bar, dining room, kitching and spacious sitting room. Of course, the outdoor area of the home takes full advantage of the stunning setting and climate, offering a private pool surrounded by sun loungers. Meals can, and should, be enjoyed outside under the stars under the poolside dining gazebo, which also offers a sit up bar and built in barbecue. Carlton Beach Villa is traditionally styled holiday home with 4-bedrooms, right on top of Lower Carlton Beach on Reeds Bay. Tropical weather, stunning sunsets and renowned beaches, what more could you want from a beach getaway? It's no surprise Barbados is a popular holiday destination for people seeking sun, sea and a state of relaxation - it's a glorious getaway. Days can be spent on one of the many beaches, exploring coves, swimming in crystal-clear waters and sunning yourself on the golden sand beaches. Some of the most popular beaches in Barbados include Mullins Beach, Gibbes Beach, Accra Beach and Paynes Bay. Many of these beaches offer facilities such as changing rooms, bathrooms, restaurants and beach bars, so you can stay on the beach long after the sun goes down. Barbados is a history-rich country, the main centre Bridgetown is a UNESCO world site and the second largest town, Speightstown, is a quaint spot with architecture dating back to the early settlement of Barbados. This villa is located on the West Coast at Reeds Bay, a quiet unspoiled beach that is also up there on the best beaches list. It is just under 2 miles from Speightstown and just under 10 miles from Bridgetown. The closest amenities are in Speightstown, however, if fancy fresh fish you can visit the Millie Ifill fish market, which is great for fresh fish and within walking distance of the villa.